Each June, the W Hotels Designers of the Future Award honors a select group of promising youngdesigners and studios who exemplify new directions in design culture. These young creatives work beyond pure product design and represent conceptually or technologically vanguard approaches, often assimilating ideas from multiple disciplines.The objective of the Award is to offer these next-generation design talents the opportunity to present newly commissioned work to a powerful audience of collectors, dealers, and journalists at Design Miami/Basel. 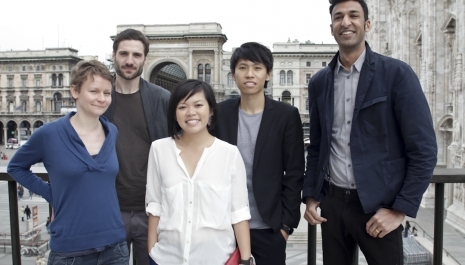 Each W Hotels Designers of the Future Award winner is given a brief and a budget to design and produce new work to be unveiled at Design Miami/ Basel. The theme for this year is “Conversation Pieces”. Design Miami/ Basel and W Hotels has asked each winner to create a project that encourages people to overcome social barriers, sparks unexpected interactions, instigates discussion among strangers, or forges new relationships. This brief aims to foreground the potential of design – whether object, series of objects, or installation – to activate social settings and to help visitors reap unforeseen rewards through spontaneous human contact.